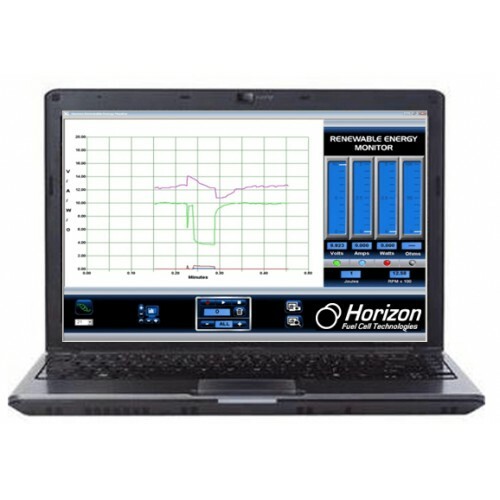 Voltage, current, power, joules, resistance and even RPM speed available at the touch of a button - displayed either on the LCD screen of the Horizon Renewable Energy Monitor (FCJJ-24) itself or as graphical data on your PC. 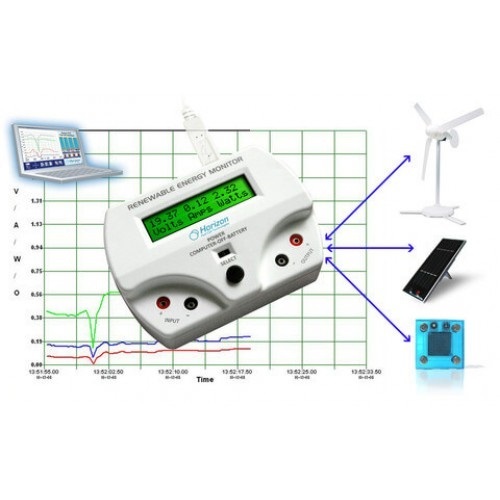 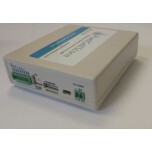 The Renewable Energy Monitor is battery operated and comes with a USB port so it can also be used with or without a computer - indoors or outdoors - where you can make direct solar and wind measurements. 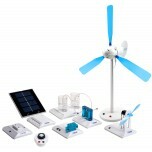 And its power is in its simplicity! 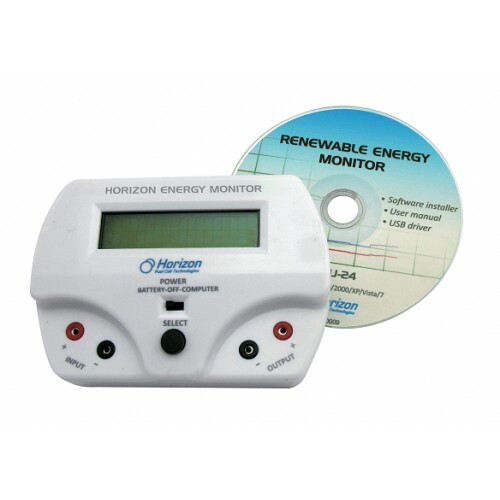 Horizon developed the Renewable Energy Monitor to allow you to avoid using the multi-meters confusing setup and cumbersome computations in order to provide an immediate, graphical way for recording data directly with no formulas and nothing to calculate. 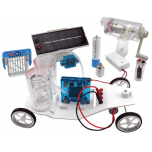 Numerous experiments and evaluation activities for hydrogen fuel cells, miniature wind turbine kits, and solar panels are now quantifiable in real time for voltage, current, power, joules, resistance, and even wind turbine RPM speed – all viewable and recordable at the same time! 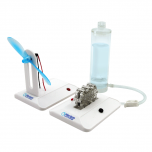 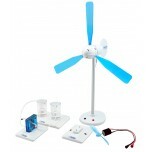 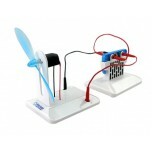 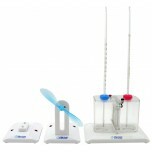 The Renewable Energy Monitor helps bring lab and field experiments back into the classroom, making it the ideal tool to complement the Wind to Hydrogen Science Kit (FCJJ-56), the Renewable Energy Education Set (FCJJ-37) and the Wind Energy Science Education Kit (FCJJ-39). 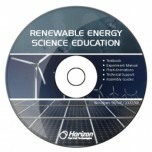 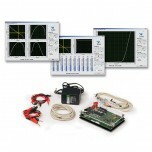 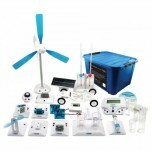 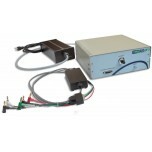 The Renewable Energy Monitor is fully compatible with any of Horizon’s educational kits. 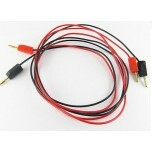 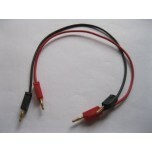 ✔ Compatible with Windows PCs (XP, Vista, and Windows 7) Please note MACs are not currently supported. 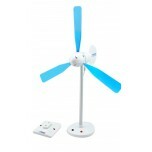 ✔ Use indoor or outdoor, with or without a computer! 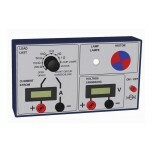 ✔ LCD screen shows: voltage (V, mV), current (A, mA), power (W, mW).